Start your hydrotherapy ritual with a shower. Detoxify your body with steam or in the sauna. The circuit concludes with a comforting traditional shower. Rest between sessions and help your self to a glass of refreshing beverages. Revitalize your body with our spa treatments. Relaxing, therapeutic massages administered by expert hands that will help you unwind your body and invigorate your soul. A truly gratifying experience of wellness and repose! Select and book your spa services in advance. Back, shoulder and neck massage to relieve muscular tension. Local massage (legs, buttocks & abdomen) using marine active ingredients that gradually reducing the padded appearance of the skin, visibly improving the body’s contour. Contour firming massage 25 min. Silky gel massages conveying a sensation of wellbeing and relaxation. The gel contains marine algae extracts which improve skin firmness and elasticity. Invigorating leg & foot massage 25 min. Legs and feet massage to help relieve muscular tension. Face, head & shoulder acupressure 25 min. A wonderful, truly relaxing, therapeutic finger pressure massage to the key energy balancing points of the face, head and shoulders. This is an ancient Oriental longevity secret for a youthful and ageless look. Multidimensional revitalizing stress-relieving massage that improves circulation applying several acupressure, reflexology and mobilization techniques. Relieve stress and tension from the calves and feet. This ancestral 50min massage concentrates on pressure points directly correlating to vital centers, activating, restoring and balancing normal body functions. Designed to soften and restore the natural balance of the skin and to pamper, relax and compose the spirit. You will feel radiant and young! A prior skin analysis will help personalize your facial treatment. Personalized Facial Cleansing 50 min. Facial cleansing to purify the skin using Opción professional products. Time Expert Anti-Wrinkles Facial 50 min. Deep treatment to fill out wrinkles and lines to completely diffuse them. Makes your skin have a young and firm look. A professional treatment for highly sensitive and delicate skin, with decongestant, anti-inflammatory powers leaving your skin with a sensation of optimum well being. An authentic caress for sensitive skins. Time Expert Facial Lifting 50 min. Revitalizing treatment that shapes and smoothes your skin with an anti-flaccidity effect. Facial Treatment For Men 50 min. Detoxifying facial treatment based on Olive leaf extract and vitamin C, leaving your skin luminous and full of vitality. Intense nutrition and hydration treatment to increase skin humidity retention level. Includes collagen masque. Anti-ageing renovation peeling masque combining the cosmetic benefits of the AHAs (group of natural acids found in fruits, like the glycolic acid), which produce natural skin exfoliation. Ideal for chronic dry skin, impure skins, wrinkles, irregular skin pigmentation. 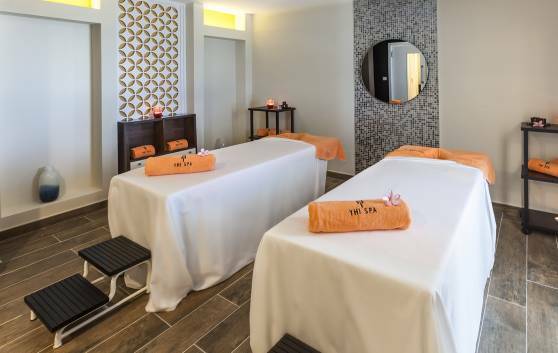 A unique space devoted to beauty and well-being, with treatments geared at intensifying harmony between the body and soul. You can feel stress slipping away as you experience the essence of complete relaxation. A team of highly qualified professionals will guide you along this soothing experience, based on a wide array of services and treatments to enhance your image. Cinnamon, ginger, cardamom, saffron, nutmeg, cloves, coriander ... the medicinal properties of these spices contribute to the wellbeing of the body and mind. Inspired by the fascinating history of the Silk Route, YHI Spa administers treatments prepared with sensual species that transport you into the mysterious world of the Far East. Exotic Ceylon Massage 50 min. Gratifying massage combined with creams prepared with shells and cinnamon extracts and essential oils. Peaceful Paradise Massage 50 min. Massage administered with spice herbs, almond, sesame and cardamom oil, rich in antioxidant properties, nutrients, and anti-aging properties. Odyssey of the Senses 50 min. Rich exfoliation based on the magical blending of the world’s finest species combined with a delicate body wrap using silk extracts and obsidian stone rituals. Ritual combining saffron extracts mixed with coriander and Ylang-Ylang essential oils and applied with exotic silk foulards based on oriental stretching techniques. The Magic of the Silk Route 100 min. It consists of a fantastic exfoliation that merges the finest spices in the word, together with oriental resins and woods, bamboo particles, poppy seeds and nutmeg. A soft body wrap based on silk extract. An exquisite massage with essential oils. Mediterranean Candle Massage 50 min. Massage with a candle that melts, while gliding it onto the skin, from candle wax to warm liquid lavender massage oil with hydrating and relaxing properties.